Chromatin structure and dynamics are prerequisite for the processes of cellular transformation and cancer propagation. Nevertheless, these changes are still poorly understood. Saccharomyces cerevisiae has long been considered as a model organism in all kinds of molecular biology studies. The only homologue of the linker histones in this organism is Hho1p, which possesses some unique characteristics in comparison to the linker histones of higher eukaryotic cells. On one hand, this protein is coded by one gene copy and on the other its molecule has two globular domains and no carboxyl – end in contrast to the other linker histones. The most doubtful and yet unproven remain its roles in the chromatin organization and in the regulation of gene expression. In the current project proposal we intend to utilize modern molecular biological and biophysical methods (including Chromatin Yeast Comet assay, AFM (Atomic Force Microscope), ChIP (Chromatin-Immunoprecipation) and FRAP (Fluorescent Recovery After Photo bleaching) as well as standard biochemical methods for chromatin studies. The aim is to study in details the role of Hho1p in the higher-order structuring of yeast chromatin and its dynamics in the nucleus under normal and stress conditions. For that reason we intend to delete the gene HHO1 in three different S. cerevisiae strains and to study the phenotype of these mutants by comparing them with their isogenic wild type strains. Additionally, we intend to probe for a relationship between Hho1p and some of the chromatin – remodeling complexes. Therefore, we plan to create double S. cerevisiae mutants comprising a deleted gene for the linker histone and point mutations in Act3p/Arp4 (an important subunit of INO80, SWR1 and NuA4 chromatin modifying complexes). The idea behind is to thoroughly investigate these mutants with the above mentioned methods in search for alterations in the chromatin compaction as well as in the cellular morphology. On the basis of the expected results we could develop a model, describing the interaction between Hho1p and the chromatin remodeling complexes in yeast cells. Such a model could be easily applied to higher eukaryotic cells, where implications in the processes of chromatin remodeling and gene expression lead to abnormality and malignant transformation. The main hypothesis that set off the idea of this grant proposal relies on the above-mentioned scientific data about Hho1p but also on the previous experience of the project team. 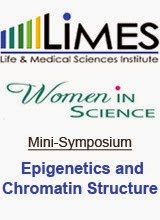 At first place, it should be outlined that the current grant proposal is a kind of continuation of Milena Georgieva’s PhD thesis in which it was shown that the yeast linker histone has an influence on the accessibility of chromatin toward nuclease action, as well as on the ability of cells to overcome temperature stress. It was also demonstrated that yeast cells with a single point mutation in the gene for Act3p/Arp4 exhibit serious alterations in the cellular morphology and changes in chromatin structure. The created double mutant act3/arp4ts26 delta hho1p during the time of the experiments in the thesis and the following studies on it led to the identification of a cellular morphology of these cells pretty much alike the cellular morphology of the deltahho1 mutant cells. Moreover, the ability of double mutant cells to overcome temperature stress was similar to the ability of deltahho1 cells in contrast to act3/arp4 single mutants. These preliminary results of the characterization of yeast cells with altered processes of chromatin – remodeling (i.e. act3/arp4 mutants) and without a linker histone (deltahho1p) prompt interesting compensatory mechanisms in the double mutant cells caused by the deletion of the gene for the linker histone. Accordingly, we decided to aim these prompted compensatory mechanisms in the current grant proposal and search for the linker histone contribution to the higher-order chromatin organization and the linker histone participation in the remodeling of chromatin structure. Such functional interplays among chromatin structural and functional proteins are very important and could reveal crucial regulatory mechanisms for the cell fate and the development of the whole organism. Research is sponsored fully by the Bulgarian Science Fund, Grant number DMU 02/8.